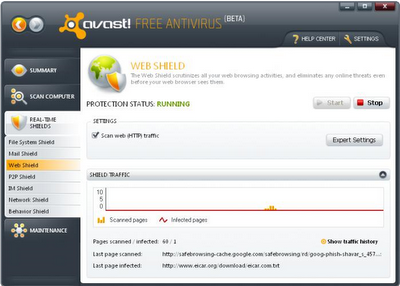 Avast Home edition is a popular freeware antivirus solution for Windows, Mac, Linux and PDA devices. Avast has professional and freeware editions of their antivirus application just like AVG and Avira. Avast 4.8, the attest stable release of this application is protecting millions of computers world wide. As per Avast there are around 90 million people using Avast Home edition. Features of Avast Home edition includes antivirus, antispyware, anti rootkit, email-instant messenger and free updates. Home edition is suitable for those who are not always connected to internet and make transactions online. Avast recently started with beta testing of their version 5 set of products. They have released Avast 5 home edition that you can download here. Download Avast 5 home edition. 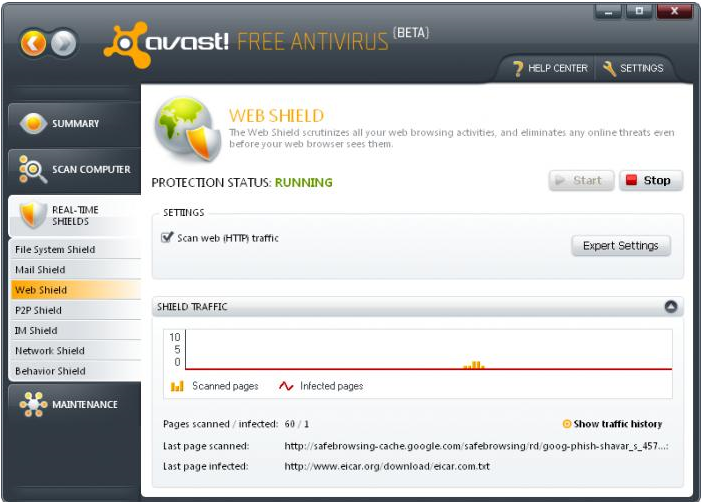 The new Avast 5 home edition has a redesigned interface as shown above. Those who used old Avast antivirus home edition with metal like interface would be very happy with the new interface. Windows 7 compatible Avast 5 home edition present the application functions in a much lucid way than its predecessor. Here are few notable features of Avast 5 home edition. Better scan speed and modes. Programs shields against viruses, trojans, web based threats and P2P- network attacks. There is a behavior shield for blocking programs based on their trait and actions. Avast 5 Home Edition is still in beta testing. So you can expect discrepancies in its performance till the final version is released. Related: Microsoft Security Essentials free antivirus. dear sir, i can used avast ,but possible you can give a free key gen. to used the avast saccesful to my pc.thank and regard to all member and powerful company.